10) "We've been talking for 30 seconds. Your arm must be getting tired." 9) "Cal, it's your brother Billy. I wrote something about you on my bat's knob." 8) "Hurry up and miss a game already; you're making everybody look bad." 7) "Please enter a credit card number for 15 more minutes of hot, steamy, unadulterated pillow talk." 6) "Did you buy the phone because it matches your hair color, which matches your cold, gray eyes?" 5) "Cal, it's me, Brian. You talk to Gary or Joe?" 4) "This is Mr. T, foo. Gimme back my necklace." 3) "Sir, is your refrigerator running?" 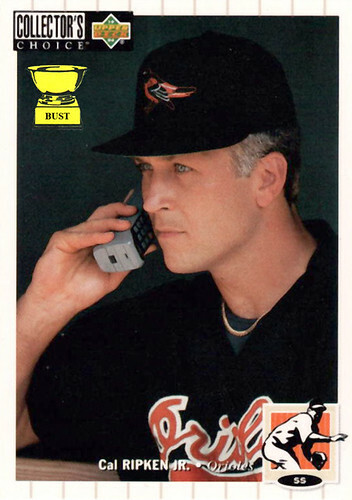 2) "When you're done with this call, just use the phone as a bat." 1) "Hey, Cal. You just answered the toaster."